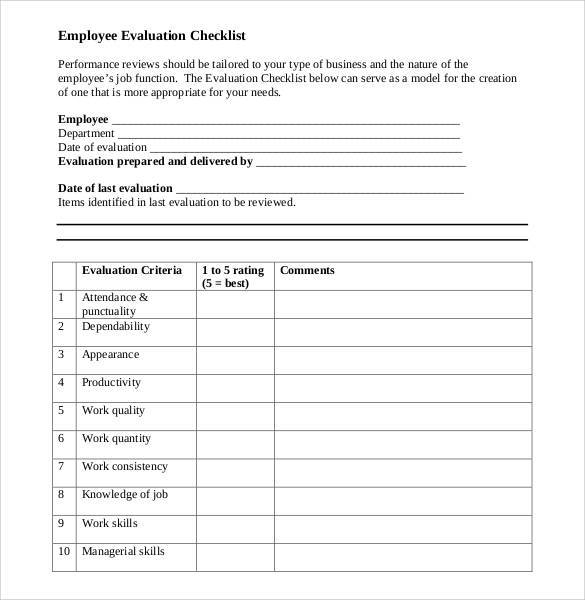 Every company has some employee evaluation procedure and system which is important to gauge the productivity at regular intervals and the Employee Self Evaluation form templates help you do that in a systematic manner. 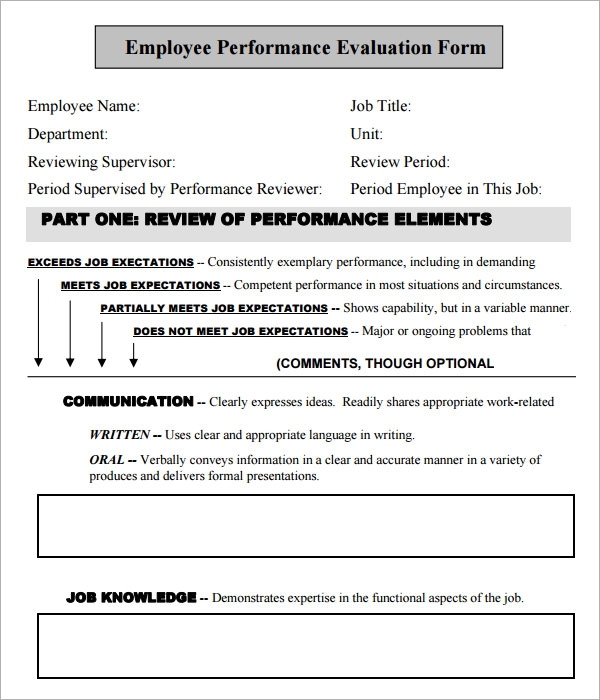 You can use the new free and premium download templates which are replete with questions, scenarios, situations and cases which will test and evaluate the employees and you can find them with ease as they are already prepared in the form of templates. 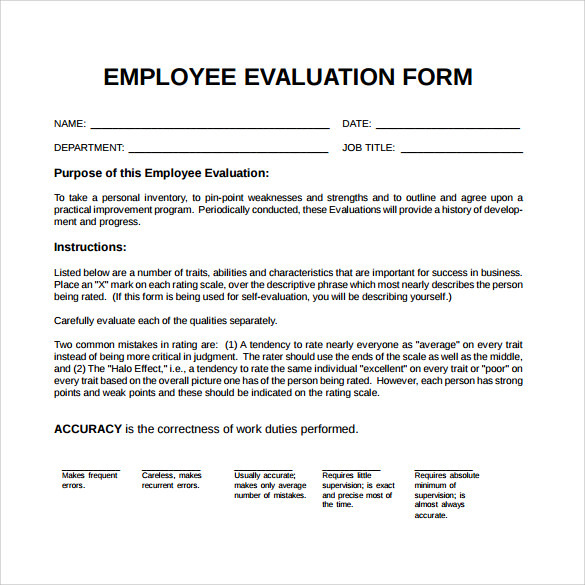 You can simply take their print out and circulate in order to evaluate employees separately and correctly. 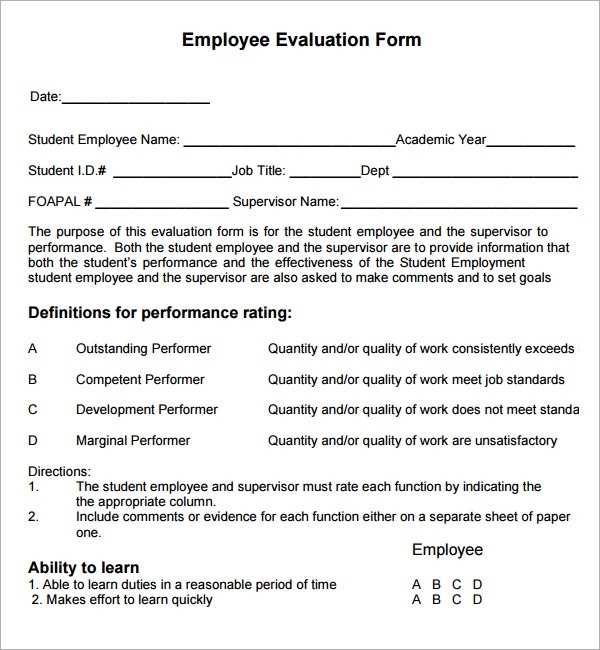 This is a performance evaluation form for administrative employees. 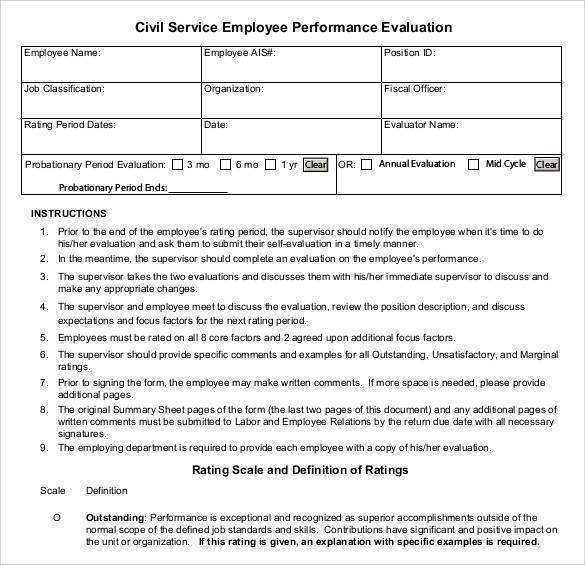 It contains description of the rating methods, summary of the process, resources to be used and then the complete form to fill to evaluate an employee on all given parameters. 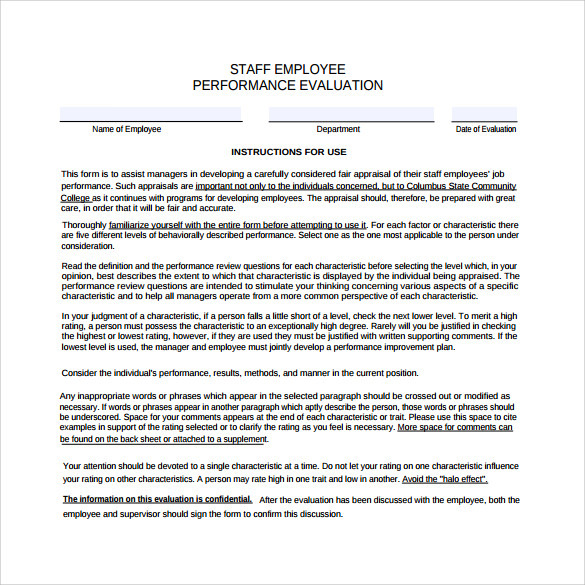 This is a performance evaluation form for new employees. 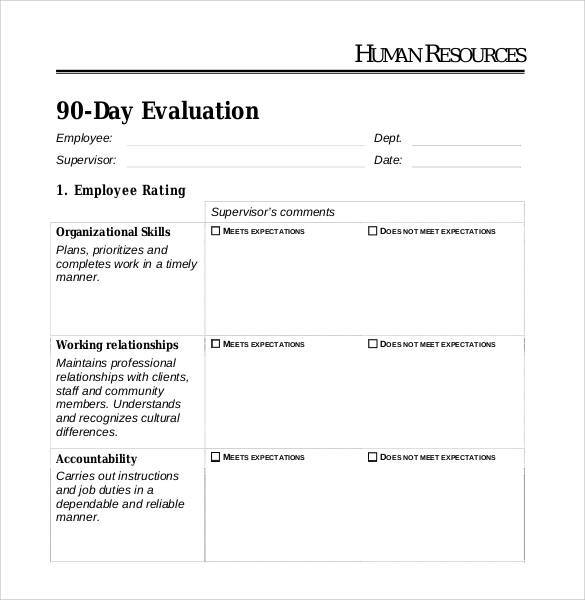 It rates an employee based on work skills, communication skills, work ethic, mission and vision, goals achieved, strengths, weakness and future outlook. 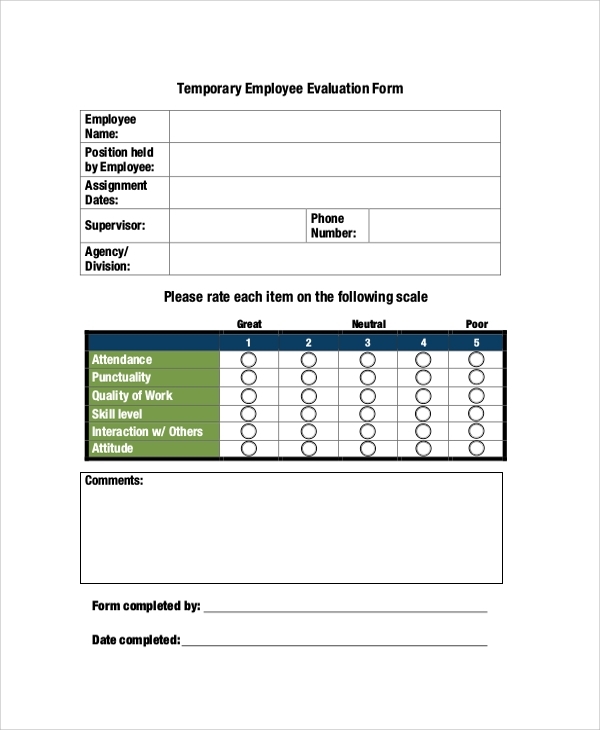 This is a standard performance evaluation form for temporary employees. It rates the employees based on attendance record, punctuality, quality of work and service, skill level, interaction and clarification, attitude and behavior. 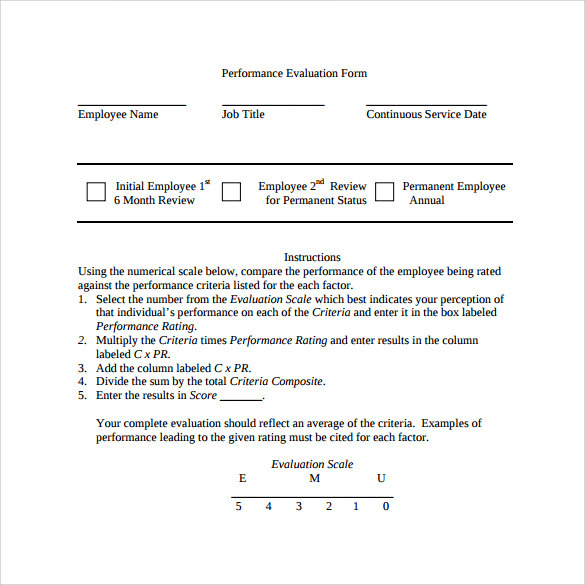 This is a proper performance management evaluation form for the employees in probation period. 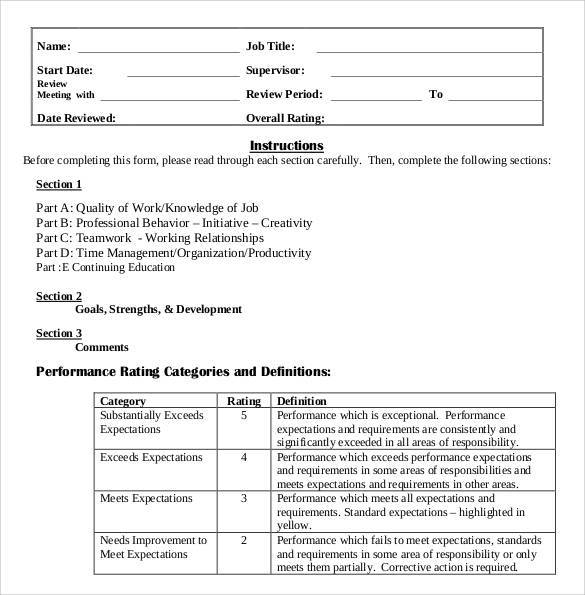 It mentions the section to be evaluated, quality of work, success and failure rate, knowledge and skills, relationship and interaction, attendance and punctuality, capacity to develop and creativity. 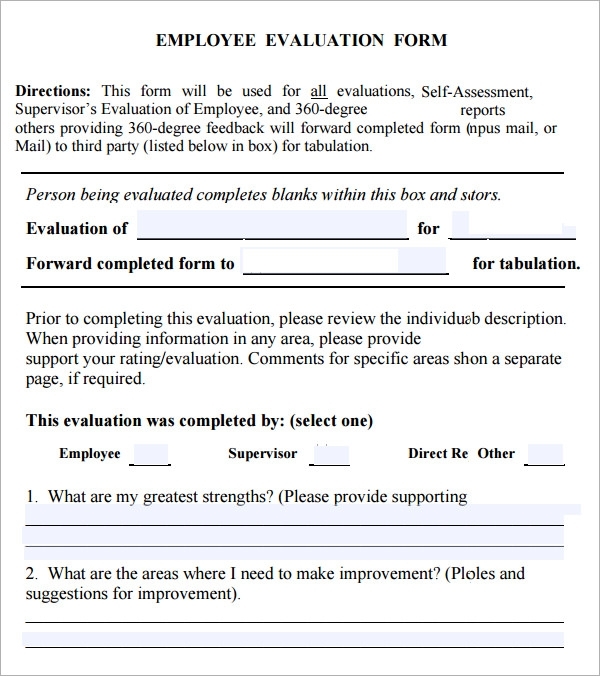 This is a general work evaluation form for any employee. 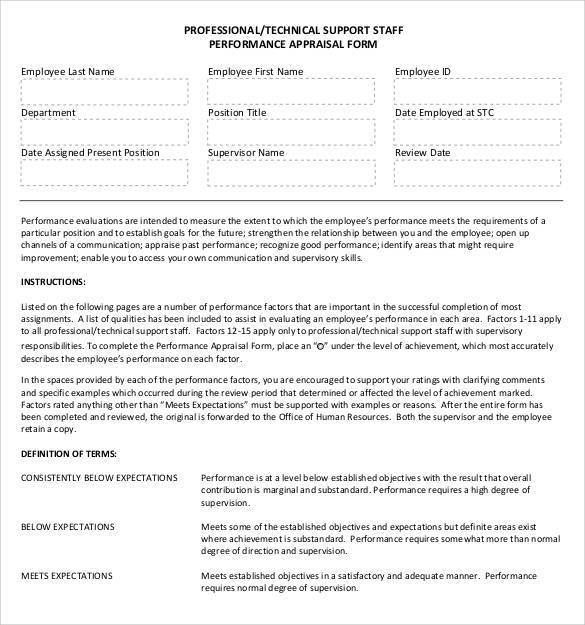 It rates an employee based on skills, passion, initiative, reliability, interaction, training, and comments for all the sections mentioned so far. 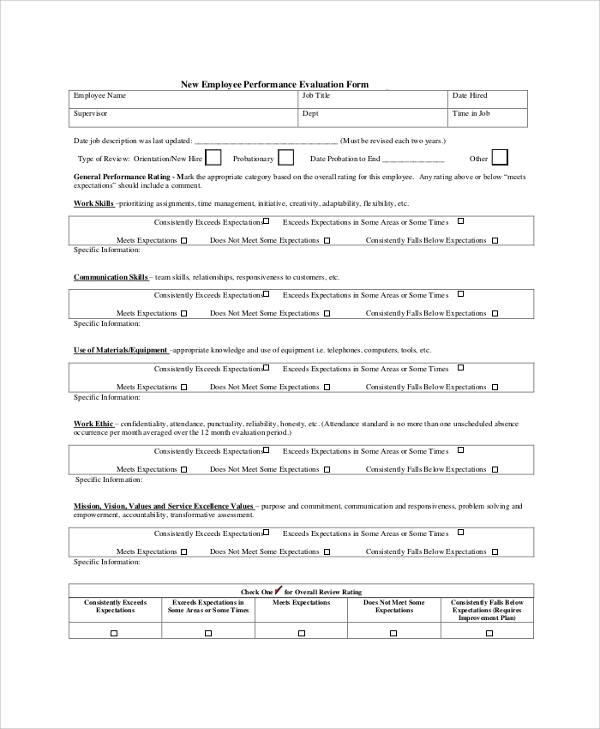 As the name indicates, this form can be used by a hospital or medical health care provider to appraise the performance of their medical assistant or an intern. 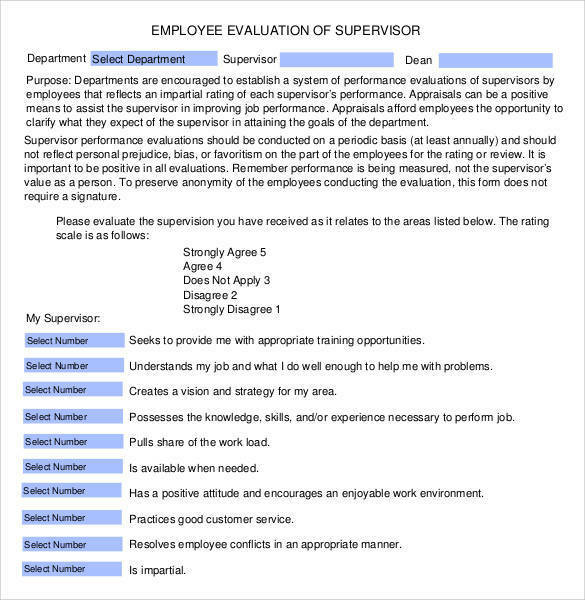 The form comprises of all the essential segments that should be taken into consideration when appraising the employee. 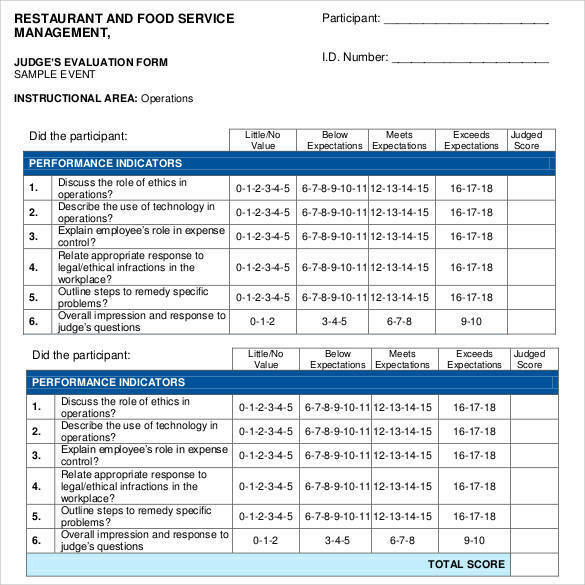 This form is used by restaurants and hotel chains to gauge the performance of their employees who are responsible for the food and beverages department. 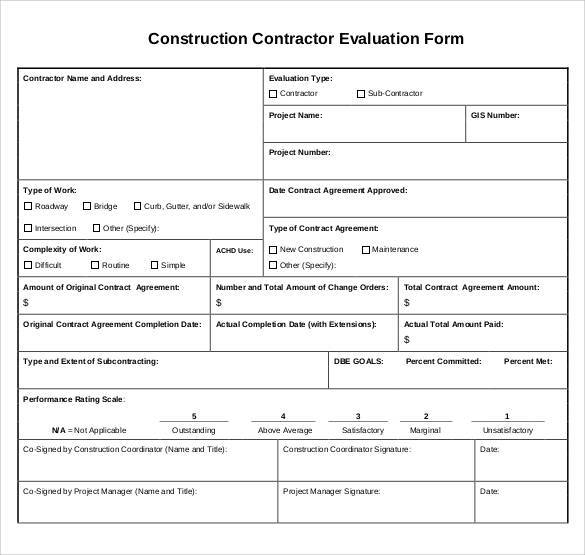 With all the important parameters in place, the use of this form simplifies the whole evaluation process. 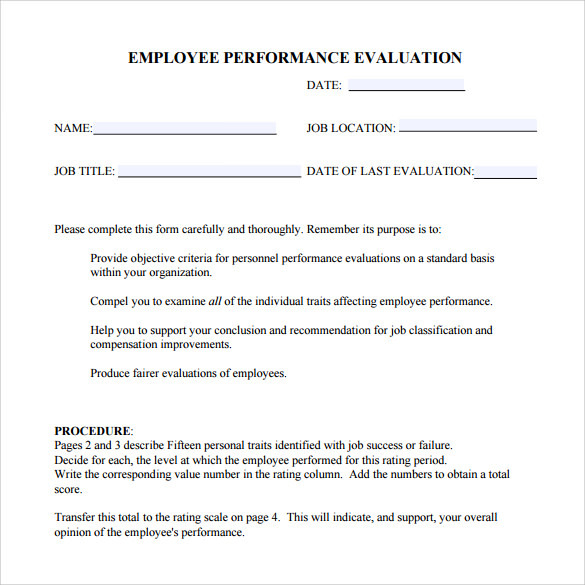 You can also take print outs of the evaluation templates and give them out to the employees and then collect and store them for future use which is much convenient than making separate copies of the same for each employee. 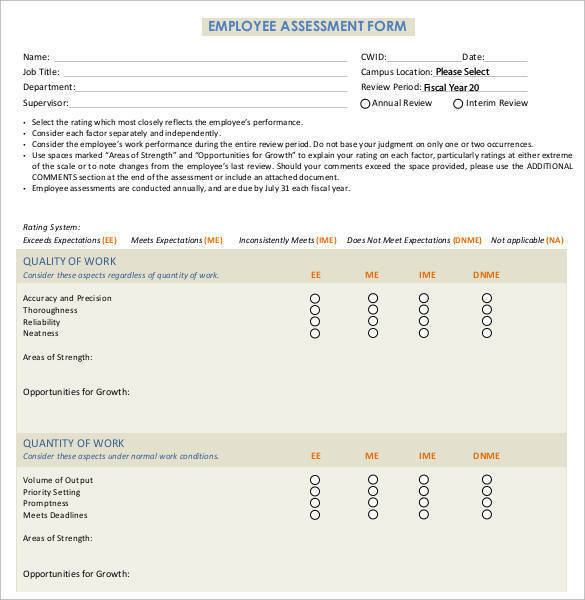 You can edit the designs, patterns and the questions or situations described in the forms and make a unique and all encompassing evaluation form for the employees, simply by using certain editing tools. 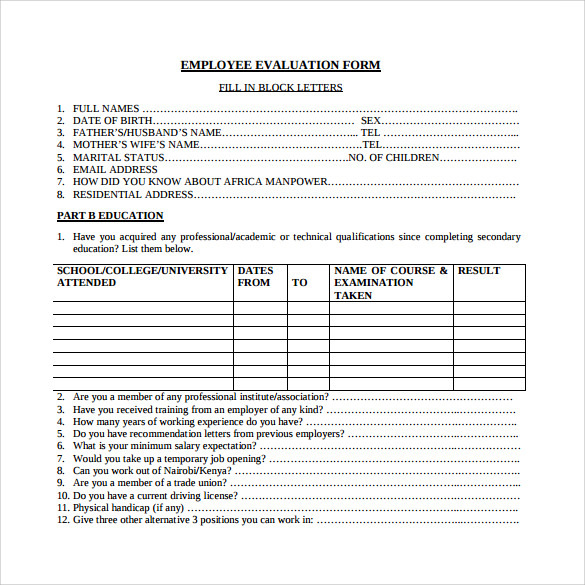 Employee evaluation form excel and word templates are present in a wide variety and the content also differs depending on the type of industry, work and the depth of information required and you can select the ones which suit your requirements. 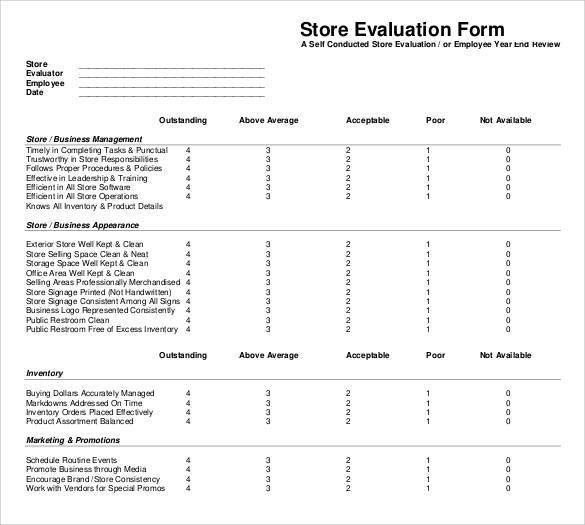 How to Create a Perfect Employee Evaluation Form? 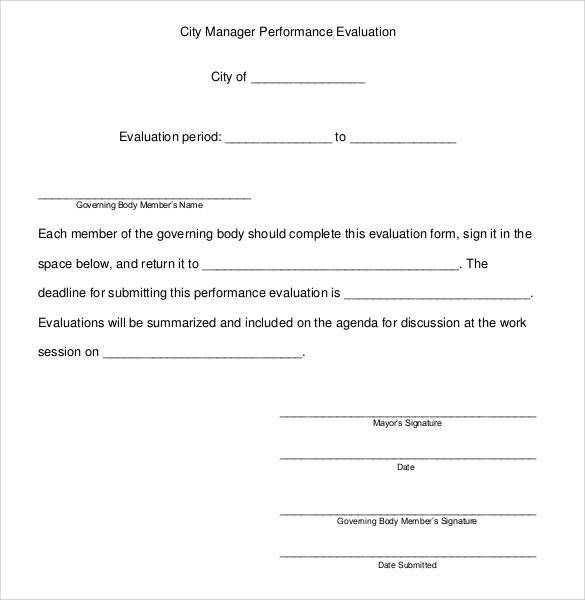 Employee evaluation forms are used by most organizations and business houses to evaluate the performance of their employees over a given period of time be it daily, weekly, monthly or yearly. 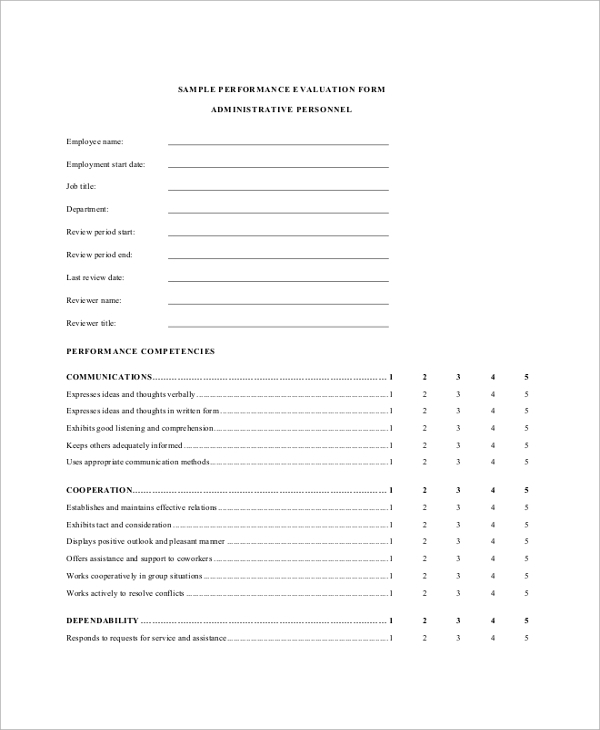 Everyone from graphic design agencies to automotive agencies use these forms. 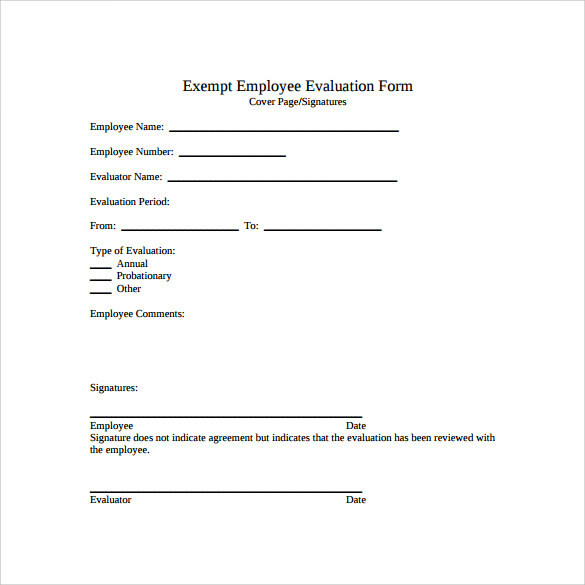 The format of these forms is quite similar to the format of the salary employee evaluation form. Here is how such a form can be created. Start by giving the form a title. You can design this form on your company’s letter head. 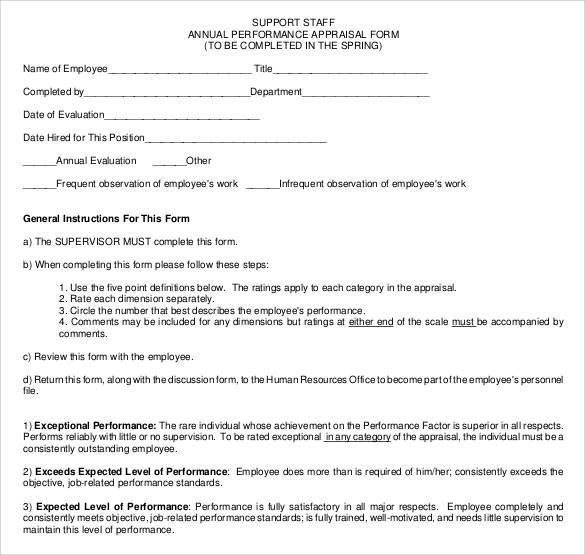 Enter the sections for including the name of the employee along with other relevant details. 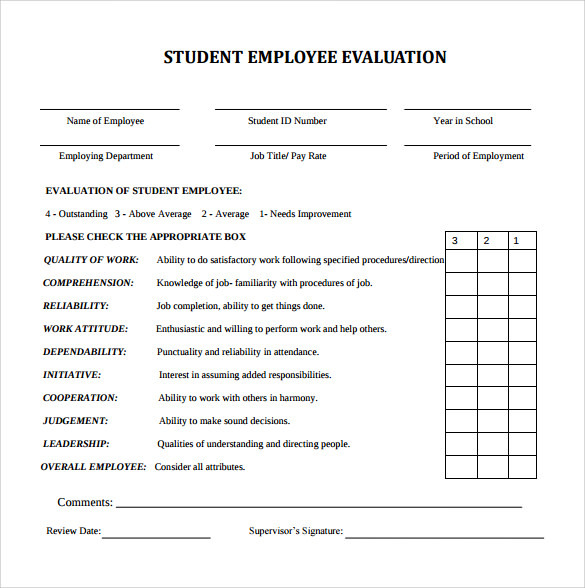 There should also be a section for listing the details of the person evaluating the employee. 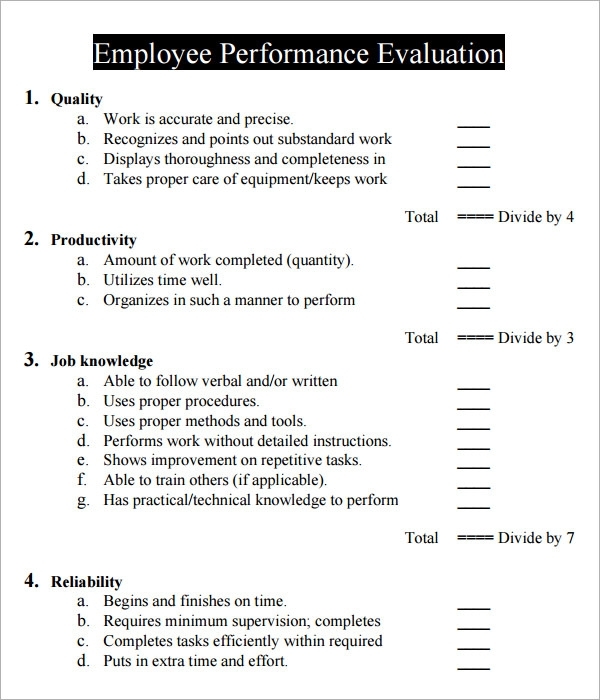 Next should be the list of the various parameters on the basis of which the employee should be evaluated. These can change as per your requirements. 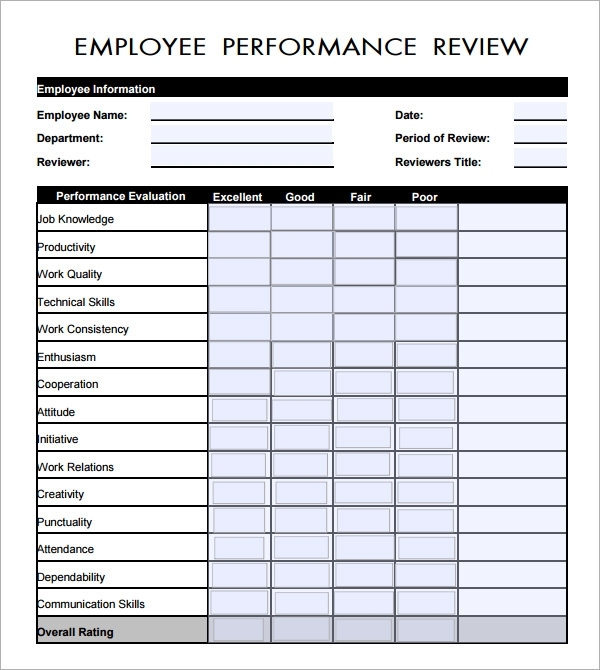 At the end should be sections for employee’s suggestions as well as the comments of the reviewer. 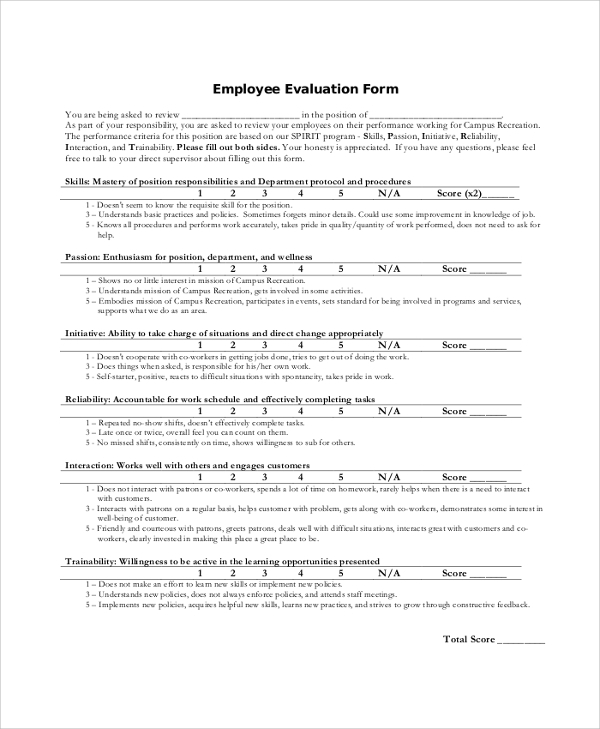 Designing an employee evaluation form can be quite taxing. However, with a few tips in tow, the task can be a tad simplified. So, here are a few tips that would make the whole ordeal easier for you. Make sure that you have all the information in handy that you would need for the evaluation and create the segments accordingly. 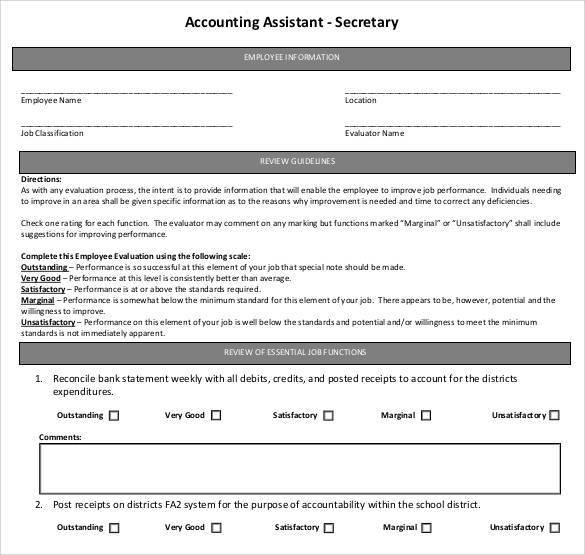 Customize the forms depending upon the nature of the job and the designation of the employee. There should be enough space for including suggestions and feedback. 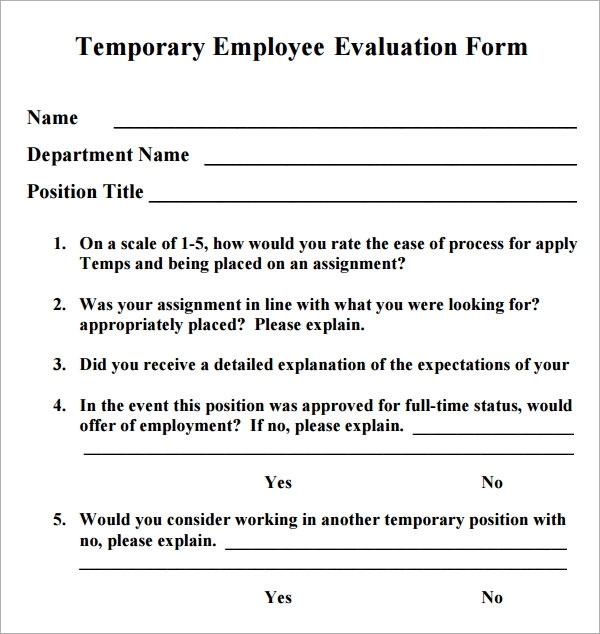 Open ended questions in the form would encourage the employees to think and open up. 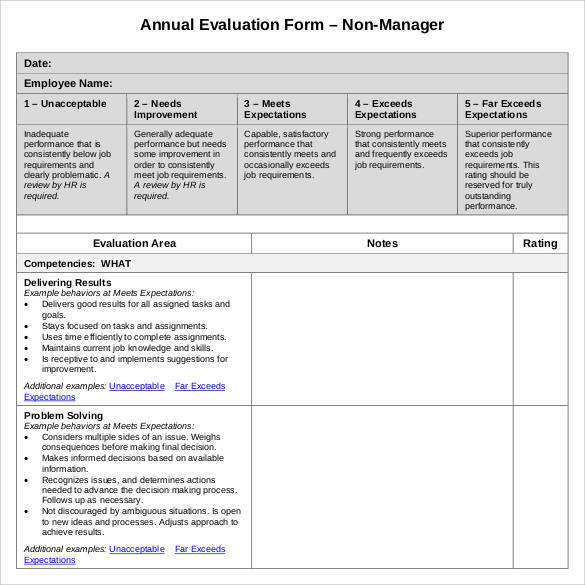 Need help to design an employee evaluation form? Fret not! 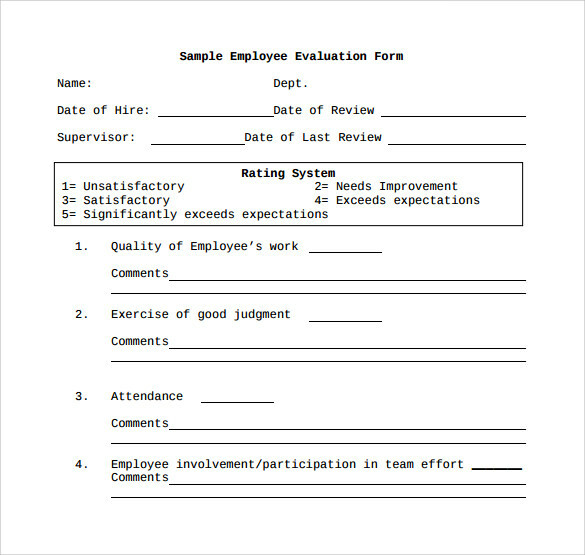 Just take a look at the different types of employee evaluation form templates that we have on offer. With a wide range to choose from, you are sure to find a template that would be perfect for your needs irrespective of the industry in which you operate. 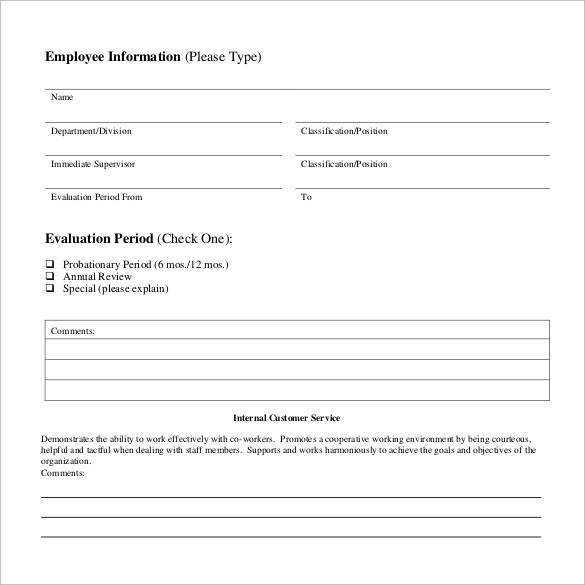 Since these forms are easy to download and personalize, creating a unique form for your organization does not seem tough.